A free collection of 7 solitaire games. 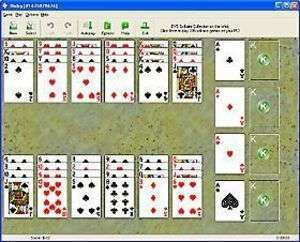 It contains the following popular solitaire variations: Bisley, Carpet, Flower Garden, FreeCell, Klondike, Nestor, Yukon. 1st Free Solitaire features: "Show Next Move" command, one move undo, selectable backgrounds, automatic card moving, restart feature, sound, and more. For security reasons, you should also check out the First Solitaire download at LO4D.com which includes virus and malware tests. Additional screenshots of this application download may be available, too. 1st Free Solitaire has a presence on social networks.